Basement Remodel & Craft Room - Meriwether Inc. In a walk out basement in Medina these owners wanted to have a place for the kids to hang out and play in that was durable enough for any kind of activity. 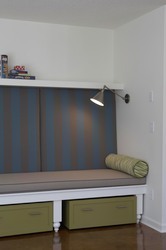 A craft room with pocket doors was created on one end of the space with plenty of layout and storage. The pocket doors are kept open when everyone wants to be connected and can be closed when gifts are being wrapped. Meriwether designed a custom stainless steel topped island on casters for easy maintenance and easy moving. With high ceilings and an eastern exposure windows were expanded to the east and added to the south for lots of sunlight. 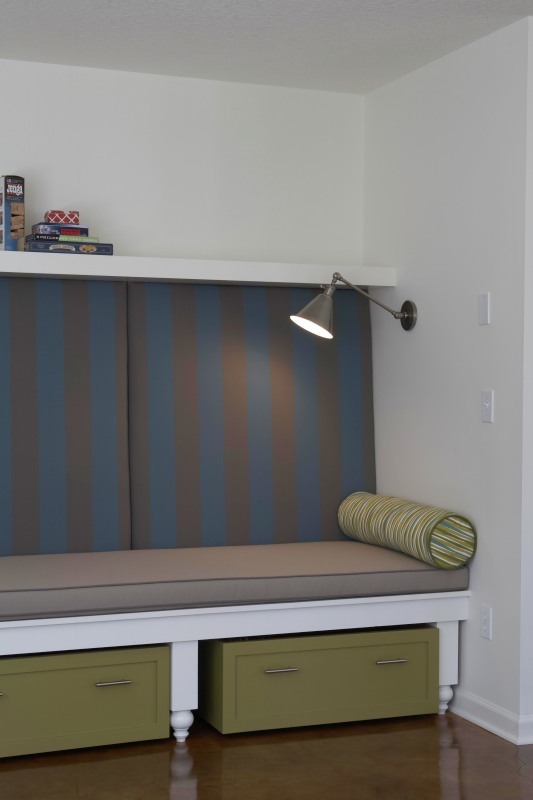 The built in bench was created to allow a place to curl up and read with lights placed within reach to be switched on when necessary. Custom green & blue storage bins on hidden casters allow for bins to be moved where playtime and cleanup occur. Best of all the “Togo” chairs are kid friendly, easy to move and easier to lounge in.